I’m actually OK with YDKJ not being in this. What you get in the Party Pack looks unreal. I can’t wait. I love your game. I am a teacher and would love to use your amazing program in my classroom. Is there any Jackbox products that allow you to make your own questions while utilizing the existing voiceovers and music from the games? Not right now, but it’s something we’re considering. I am a teacher, too, and I use a website called “kahoot” that allows you to make up your own questions. Students use their own devices or laptops to respond to questions. Will any of these be sold separate other than Quiplash? Also will there be any options of a package not including Quiplash for those that purchased the game when it first came out and the Quip Pack 1? No, unfortunately, the only way to get it is to get all 5 games. Thanks for the response Evan, as a long time promoter of the first Jackbox to all friends and family, I was excited to buy Quiplash and have enjoyed it so far. Shortly after I purchased this I found that this second Jackbox Party Pack was announced. I understand you guys run a business and the goal is to stay profitable, however I feel it’s unfair to your loyal fans to release one game as a standalone that you plan to release as a full collection a few months later with no offering for a discounted rate for those who own the game or even the previous collection. I will just stick with the first party pack and Quiplash until the inevitable PSN sale it will be on. Sorry, I cannot justify the purchase any other way. Thanks for making great games either way though! Yes. I understand your frustration, and we really appreciate how you’ve been an advocate for Jackbox Games. We talk about this all the time and going forward we want to avoid situations like this where recently-released games appear in a bundle soon afterwards. Will this be available to those in Australia? Can it be accessed from the Australian Xbox Store on Xbox One? I’m still confused a bit with BIDiots… Does what you actually draw have any affect on the price? Still nothing on the books for Wii U? No Drawful 2? One of my favourite party games of all time. Hopefully we’ll see Drawful and YDKJ back for next year. Even a Drawful update to the existing party pack or a DLC addon would be welcome. I own the Jackbox Party Pack on PS4. I also bought Quiplash separately. Any chance all of these games can be combined into one big pack? It is slightly annoying having to close out of each pack to play separate games. When will this be available on Xbox One for those in Australia? says 13th but i still cant purchase it. I cannot seem to find party pack 2 on the australian xbox one store, is it possible to buy it elsewhere? 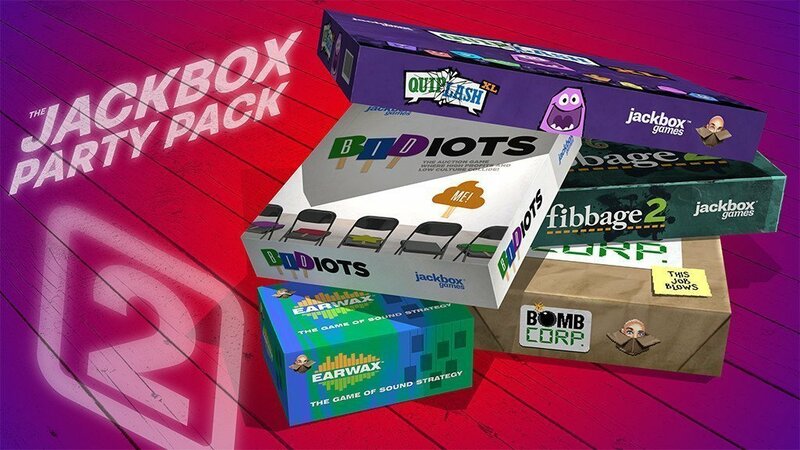 Is there any word on how far away the Xbox 1 version of jackbox party pack 2 is for the NZ/AU area? Why can i not get the new pack in Australia? It will be available on PS3 and PS4 in Australia next week. Have you ever thought or joked about the games being in physical form? If so, how will you think it will work out in physical form? HI, when will the pack be released on the PS4 in the UK? All of these games are amazing, well maybe not lie swatter and wordspud, but all the others are top notch. I just hope you guys keep supporting these games with dlc or newer versions. I also second the comment from up top to not put recently released games in the party packs. I bought standalone fibbage day one, then the party pack day one. I also bought quiplash day one and the dlc, then bought the party pack day one. I have spurred my parents and multiple friends to buy these games as well. P.S. Drawful 2 needs to be made pronto!! Can you play these games via streaming. Say we are at home and playing on Xbox one can a friend play our game at their house via their xbox one? Any chance of this coming to Apple TV? I would love to play one of these games in my classroom, but Steam is blocked. Is there any possible way to play this on PC other than Steam? Ive already bought Party Pack 2 on my PC. Is there any way I can avoid paying for it again for my ps4? Why no Wii U? I’ve got a Wii U and I’d like to play this when friends come over. Will there ever be a jackbox party pack/jackbox party pack 2 for wii u? Would also love to see a Wii U version!